How long does it take to buy a house? It’s a big question, especially for people who hope to time their home purchase with when their rental lease is up. Or before the start of school. Or when you’re closing on the sale of your old home. Or any number of other time-sensitive situations you’re trying to manage. 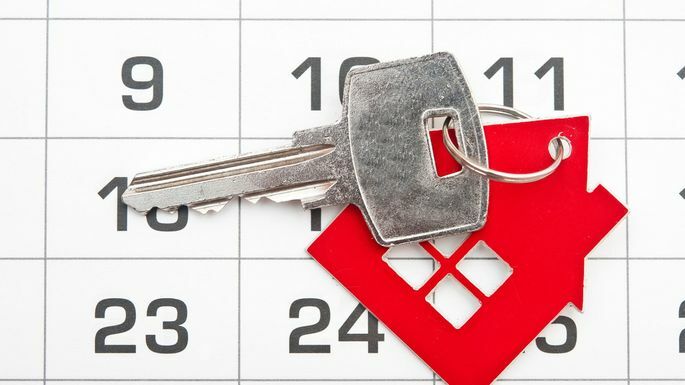 While timing a home purchase is tricky and will vary based on a variety of factors, many experts estimate that you should expect the home-buying process to take a minimum of four months. Talk about a long slog, eh? Yet there are good reasons why buying a home is no impulse purchase. To help illuminate what’s going on, here’s a rundown of the various stages you’ll encounter to help you time your house hunt just right. Your first step shouldn’t be toward all those exciting open houses; it should be to a lender, presuming you need a mortgage to make your home-buying dreams happen. “You’ll want to speak to a mortgage broker to start the loan process early so there are no surprises,” says Realtor® Beverley Hourlier with Hilltop Chateau Realty, in San Diego. If your finances are in good shape, you can get pre-approval, which is a guarantee that the bank will lend you a certain amount of money. Having this guarantee in hand is a major asset when home shopping, because it shows sellers that you can afford their home and mean business. If your financial circumstances don’t change much by the time you close the deal, you can ask a lender to extend that promise for an additional 90 to 120 days or longer; you can also lock in a great interest rate so it doesn’t rise by the time you’re actually buying a home. While looking at real estate listings online is fun and easy, things slow down once you get to the point where you’re visiting houses in person. After all, you can’t just pop in whenever you want; you can visit only during an open house (often only on the weekends), or schedule individual appointments at times that work for the seller. So in the same way you have to kiss a lot of frogs before finding a prince, you’ll likely need to see a lot of homes before you find one you love. On average, people see 10 houses before they make an offer, but that number can be much higher. Once you’ve found the right house and made an offer that’s been accepted (which can typically happen in a few days), the waiting game really begins. On average, it takes around 50 days to close on a loan, from the time lenders pre-approve your mortgage application to the day you sign all the documents and get the keys. Can you see now why getting pre-approval early is so important? In fact, securing financing is the most common holdup in buying a house. Even with a pre-approval, it can still take 30 days for the lender to do its due diligence by conducting a home appraisal to make sure it’s a good investment (since after all, the lender’s money is on the line). Meanwhile, it will also take time for you to do your own due diligence to make sure the home isn’t hiding some glaring flaw you’ll regret inheriting. You can do this by checking the sellers’ property disclosure statements for any problems they’re aware of, and also hiring a home inspector to check out the house from top to bottom for any problems. All of this takes time. Bottom line: As much as people complain about how long the home-buying process takes, it’s all in the interests of making sure you’re happy once you move in. So when in doubt, start now! If you’re worried you’ll find your dream house too soon, there are ways to negotiate with a seller so that it all works out.